This episode was based on the short story 'Double Sin', first published in 1928. It was adapted for television by Clive Exton and directed by Richard Spence. Exton stays true to the essentials of the plot, and much of the dialogue is kept intact. However, there are certain extensive additions. First, there's the suggestion that Poirot has decided to retire (like so many times before). The result this time around is that Hastings has to investigate the case more or less on his own with the help of the local police - a rather unbelievable plot, if you ask me. Why would he be allowed to tag along on the investigation? He is not even "the great detective". Anyway. It's also Poirot, not Hastings, who suggests that they should go on holiday to reinvigorate Hastings's little grey cells! Second, there are a couple of added sub plots, including the search for Miss Lemon's missing key (aided by Mr. Dicker), a lecture by Japp, secretly attended by Poirot, and an entire sub-story for the only 'real' suspect in this story, Norton Kane. Third, the setting is moved to the Lake District (featured briefly in The Adventure of the Clapham Cook and later in Dumb Witness), which also leads to the inclusion of a ferryman who witnessed the arrival of the culprit to Baker Wood's hotel. Fourth, the reason for the bus trip, a request from Poirot's long-time friend Joseph Arons, is removed, and instead Hastings is the one to suggest a sightseeing trip. All in all, though, Exton's adaptation is a faithful retelling with, for the most part, understandable changes. Director Richard Spence makes good use of the location, particularly in some very scenic shots of the bus ride and the magnificent Art Deco hotel. There's also a lovely surrealist dream sequence in which Poirot and Hastings urge Miss Lemon to use her little grey cells to recover her keys. (Re-watching it, I was actually reminded of the somewhat surreal sequence in the adaptation of Three Act Tragedy in which Poirot is thinking in front of a house of cards). The production design is faultless, particularly in its recreation of the hotel dining area, which this website suggests was done especially for the film (on location), complete with a wall mural. The locations used for the episode include Holland Park (the opening scene), Midland Hotel in Morecambe, Lancashire(now converted into flats), several buildings in Kirkby Lonsdale, Cumbria, the area of Middleton, Cumbria, and Wray Caslte, Cumbria. The soundtrack is quite effective, once again bringing to mind the pastoral elements of the English countryside (like in The Adventure of the Clapham Cook and The Mysterious Affair at Styles). This score is by Richard Hewson, who stepped in for Gunning in a couple of the Series Two episodes. To see Poirot in retirement mode is quite nice, but of course completely absurd, considering the setting of the episode. In any case, his retirement conversation (and his refusal to take the case) seems to be somewhat reminiscent of the scene that was deleted from the adaptation of Peril at End House, so I can easily forgive Exton for including it. He knows his Christie. It's also nice to see the addition of Mr. Dicker, even if he isn't a Christie creation. This creates a sense of continuity between the separate series. Also, there's a lovely blink-and-you'll-miss-it reference to a photo of Poirot from his christening (!) discussed by Hastings and Miss Lemon - a nice way to display the intimate friendship between the three main characters. Similarly, the inclusion of Japp's lecture brings to mind a scene in Peril at End House that was not included in the adaptation, in which Japp admits having let Poirot in on quite a few cases in the past. It's also nice to see the rivalry gradually turning into admiration and friendship (although I disagree with certain fans who suggest that Japp somehow despised Poirot in the first couple of episodes. 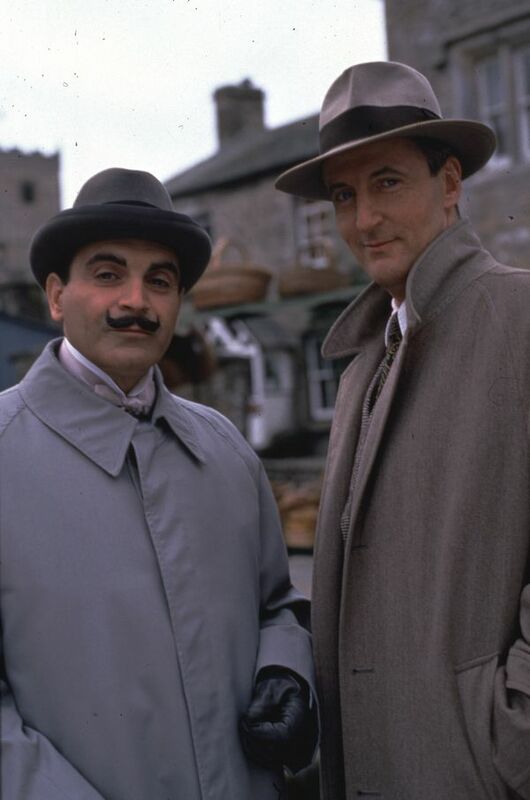 As we shall see in the adaptation of Styles, Japp's admiration for Poirot and his methods has been there since the very first case they did together. Finally, there's a nice little adaptation joke added to the story, as Poirot asks Hastings why he has never attempted to grow a moustache. As Christie readers will know, Hastings does in fact have a moustache in Christie's book, but this was dropped when they started making the television series (probably because it would look silly with two mustachioed leads!). That decision was probably made by Exton himself (along with Brian Eastman), so it's nice to see him include a (very oblique) reference to it in an adaptation. As to guest actors, there are several nice performances here, but no one really stands out, possibly apart from the delightful caricatures of village bobbies heading the investigation, played by David Hargreaves and Gerald Horan. On a side note, the Midland Hotel is still a hotel and not flats. It got a reasonably sympathetic make over a few years ago that have helped to preserve this Art Deco gem. If you are in the area of the Lake District, I'd certainly recommend calling by, even if only for a drink and a snack. It was nice in this episode to discover just how much Japp respects Poirot! Going by Japp's dreams as described by Hastings in The Incredible Theft (Japp at one point speaks French in his sleep!) Japp really wants to BE Poirot! Well, initially, Japp was saying he wasn't fond of private detectives in general...and then again, that may have been just an excuse to lead into the praise of Poirot. I did like the way Poirot and Japp's friendship developed, but I wouldn't have minded if the series had also used some of the other police characters who were antagonistic to Poirot or didn't take him seriously. There was, for example, Inspector Miller, who was "wont to say that Hercule Poirot was much overrated." Adds some extra zing of triumph when Poirot is proven right in the end. I feel it's a recurring problem of detective fiction that police are so antagonistic towards detectives who have proven their worth - especially the ones who don't rate them. Nor do I like the trope of the stupid policeman. The development of Poirot and Japp's relationship was a welcome step in that respect. Your summary of the many changes between original story and TV adaptation is very good, Eirik - so good, in fact, that it is a surprise (and a disappointment) to find you calling it "a faithful retelling" on Exton's part. There is, in fact, very little of AC's story left in the episode, which has several severe drawbacks among which the inconsistent behaviour of Mary, the inclusion of ANOTHER chase scene (! ), and a Gunning-imitation score (stodgy theme played over and over and over again) are only the most obvious. Hi Eirik, thanks to you and Joan for the location info. One addition: I recognised the interior of the building where Japp gives his lecture as Normansfield Theatre in Richmond upon Thames. Saw this for at least the second time, having forgotten whodunit, but this time I noticed the music. It seemed to be a variation on the Poirot theme in the style of Percy Grainger or Ralph Vaughan Williams, and it was quite effective as the bus rolled through the Lake District countryside. And it struck me as an homage, where a lesser composer would have made it a parody a parody. A very confused and convoluted episode. What exactly were Norton Kane and his lady friend up to? Why were they chased by Hastings and the police then let go? Did they ever steal or possess the miniatures? And what became of Mary and her grandmother? The original story implied that they weren't charged. Hastings did mention Wood's name before they were found out!